United Nations Ambassadors Vasily Nebenzya of Russia, left, Liu Jieyi of China, center, and Nikki Haley of the U.S., right, confer after the United Nations nonproliferation meeting on North Korea, Sept. 4, 2017 at U.N. headquarters. With a new sanctions package under international consideration following North Korea’s sixth and most powerful nuclear test last week, analysts say China still appears reluctant to support an oil cutoff, a measure that could trigger destabilization of the Kim Jong Un regime. Speaking at an emergency meeting of the U.N. Security Council called after Pyongyang on Sunday tested what it claimed was a hydrogen bomb that can fit onto an intercontinental ballistic missile (ICBM), U.S. Ambassador to the United Nations Nikki Haley said Monday that the U.S. is running out of patience with Kim, who is “begging for war.” She said only the strongest sanctions would allow a resolution of the growing nuclear threat through diplomacy. U.S. Ambassador to the United Nations Nikki Haley speaks at the American Enterprise Institute in Washington, Sept. 5, 2017. Haley said the 15 Security Council members would negotiate a new draft resolution of tougher sanctions this week and push for a vote next Monday. It has been just more than a month since the Security Council adopted a sanctions resolution in the wake of the regime’s two long-range ICBM tests, conducted in July, aiming to slash a third of Pyongyang’s $3 billion annual export revenue by banning coal, iron, lead and seafood. What remains untapped that has the potential to stifle Pyongyang’s nuclear pursuits is cutting off its supplies of oil and other fuels. The U.S. draft resolution of new U.N. sanctions, obtained by VOA Wednesday, calls for a ban on the sale of oil, as well as refined petroleum products and natural gas liquids, to North Korea. Support from China and Russia is critical to impose an oil embargo on North Korea. The two countries are not only permanent members of the Security Council but also major energy exporters to the reclusive country. But Russian President Vladimir Putin on Wednesday resisted the idea of blocking oil shipments to the North as a punishment for the regime’s continued development of nuclear weapons and as a way to force the country back to the negotiating table. Beijing, from which Pyongyang imports nearly all of its oil and gas, has yet to indicate its position on such a measure, only reiterating its support of peaceful negotiations. 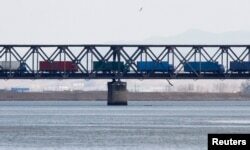 Trucks drive on the Friendship Bridge over the Yalu River which connects North Korea's Sinuiju to China's Dandong, April 11, 2013. “The leverage [the Chinese] have on crude oil is immense,” Joseph DeTrani, former special envoy for Six-Party Talks with North Korea, told VOA’s Korean Service. DeTrani said the consequence of severing China’s oil supplies to North Korea would be disastrous — the crumbling of an already fragile North Korean economy followed by the implosion and destabilization of the regime. Despite China’s strained relations with Pyongyang in recent years, the odds of Beijing publicly backing oil sanctions seem remote, he added. Richard Bush, a senior fellow in the Brookings Institution’s John L. Thornton China Center, said Beijing walks a fine line between taking punitive measures against Pyongyang for its provocative acts and providing enough resources to the regime, allowing it to survive. As Bush puts it, China wants to prove that it is “a real tiger” to Kim, who has ignored its advice to show restraint and proceeded with various weapons tests. FILE - This combination of file photos shows North Korean leader Kim Jong Un, left, and Chinese President Xi Jinping. But at the same time, China worries that imposing a blockade on oil to North Korea could put the country in danger of collapse. China, which shares a border with North Korea, not only fears a refugee crisis if the regime fails, but also values North Korea as a strategic buffer between China and South Korea, where the U.S. maintains a large military presence. It is likely China would try to create some flexibility when considering new sanctions, such as setting a ceiling for North Korea’s annual oil imports or pushing forward a graduated approach to restrictions on crude oil, Bush suggested. “This would be in the hope that flexibility on the part of the international community would lead to flexibility on North Korea’s part,” he added. “But I don’t think that’s going to work. “China doesn’t want to be seen as sort of totally being dictated to by the United States. It wants to preserve its own freedom of action and flexibility, but at the same time be responsive to the concern of the international community about where North Korea is going. So I would look for some sort of intermediate position,” Bush said. With the latest nuclear test producing an estimated explosive yield of 120 kilotons,10 times more powerful than a hydrogen bomb test a year ago, the Chinese are concerned about the level of threat North Korea poses to their country, said Yun Sun, a China expert at the Stimson Center in Washington. Nevertheless, there has been no indication from China that it is willing to cut off its oil supply to North Korea at this time, Sun said, adding it could instead move to place oil exports under a “humanitarian” exception during U.N. Security Council negotiations. “So if China categorically put oil supply and put the food assistance to North Korea under the humanitarian catalog, then I think it will be very tricky for countries to demand China to cut the supply because the Chinese will argue that those are for humanitarian purpose,” Sun said. North Korea Threat: What Options Does the US Have?